Pumpkin is a favorite seasonal food, so why not share some with your dog! Pumpkin is low in calories and high in fiber, so it's great for dogs that may need to shed a couple pounds. It's sweet and filling so they won't feel left out when it comes to treat time. The pumpkin seeds are quite nutritious, too. The are high in essential amino acids and zinc, not to mention iron, fiber and protein. Please only give your dog shelled, raw, and unsalted pumpkin seeds. OK, enough about pumpkins, let's make some homemade dog treats! Pumpkin Pops for Pups - OK, so fall may not be the best time for frozen dog treats, but we just love how easy this dog treat recipe is. We're sure your dog will agree that any time is a good time for pumpkin ice cream, especially when it's frozen into his favorite dog treat toy! Crunchy Pumpkin Dog Treats - You'll be hard pressed to find a more savory pumpkin dog treat recipe. These dog cookies have sausage and potato mixed in with sweet pumpkin. 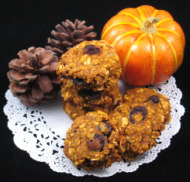 I haven't spent all my time making pumpkin dog treats, even though that would have been fun! I've recently bought, read, and reviewed a great e-Book on How to Start Your Own Dog Bakery. Actually I've bought and read three of the most popular dog bakery books, and I like this one the best. If you're considering taking your hobby of baking homemade dog treats to the next level, you most likely have tons of great ideas and puzzling questions. When you're just starting a new venture, the best thing you can do is plan. There are many well written business books on the market, but you will also need to read a book all about being a successful pet-trepreneur! :) So, read my review of How to Start a Dog Bakery: A Guide for the Animal-Loving Entrepreneur, and see why I think this is a great book for starting your own dog bakery. I get questions and requests for dog treat icing recipes all the time, so I know you're going to love the book. It will be out in December, so next month I'll share excerpts from the book, and maybe a picture or two! "I just wanted to comment on the layout and how simple your site is easy to navigate around. The tips and ideas all are great, and I look forward to trying out some of the yummy treats for my girls." What are your thoughts? Don't keep them to yourself, Contact Us and let us know what you love, like, or even dislike about Dog Treat Kitchen.com. The more you share, the better we can become, for all dogs and dog treat bakers everywhere. Those sweet big brown eyes of your dog sitting next to you at the dinner table, just waiting for a nibble of your turkey. Don't make your dog beg! Make her very own savory turkey dog treats instead! We'll bring you our favorite turkey dog treat recipes. And, if you have a favorite dog treat recipe, share it with us and dog lovers around the world.